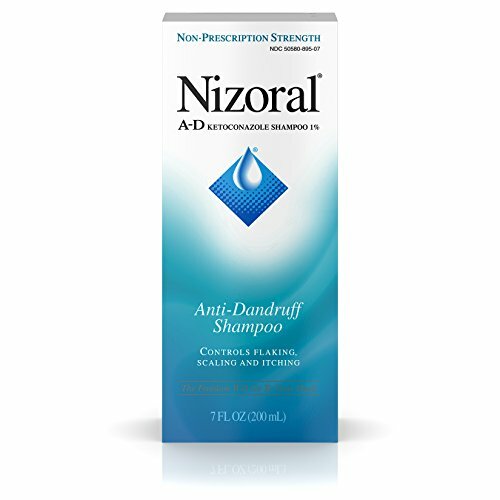 Fight dandruff outbreaks with Nizoral AD Anti-Dandruff Shampoo 7 oz. This powerful shampoo controls flaking, scaling, and itching caused by dandruff. It combines the effectiveness of ketoconazole 1%, a proven dandruff-fighting ingredient, with salon-tested gentleness. Use it just twice a week in between your regular shampoos to control dandruff. It’s gentle enough to use on color-treated, chemically processed, and gray hair, and has a thick, rich lather that rinses clean and leaves your hair smelling fresh. The number of negative reviews for Nizoral AD Anti-Dandruff Shampoo 7 oz is well within the parameters of normal dissatisfaction – 6% of all reviews. The main thread for the negative reviews was, “the formulation changed” for earlier reviews and “it does not work” throughout the entire review period of 4 years. Some more serious results from using the shampoo were noted. One review suggested searching for the affects of the shampoo, which we did. “A very serious allergic reaction to this drug is unlikely, but seek immediate medical attention if it occurs. Symptoms of a serious allergic reaction may include rash, itching/swelling (especially of the face/tongue/throat), severe dizziness, trouble breathing. We suspect the negative reviews about a less effective formulation, may have been reducing the ketoconazole from 2% to the current 1% due to increasing health concerns. Nizoral AD Anti-Dandruff Shampoo 7 oz is a very popular shampoo. It is rated #1 in Shampoo and #2 in Hair & Scalp Treatments. The health score is higher than other favorite shampoos, so we wonder why we are not jumping for joy at the health score and the evidence that it works well for 94% of the people who try it. Nizoral AD Anti-Dandruff Shampoo 7 oz is SLS and SELS free but there is a Toxic 12 ingredient, the Cocamide MEA. Adding all this up, we reduced our rating to (4 / 5), but urge caution when considering this product for use. While the health score is pretty good, use with caution. That way you can balance the effectiveness in light of the toxicity scores. Nizoral anti-dandruff hair shampoo Features: Controls flaking, scaling and itching associated with dandruff. Protect from light and freezing.